Family and friends of the late Bill Tuchscher gathered to honor their fallen rider at the Husky Memorial. Photos by Marcus Yam / Los Angeles Times. 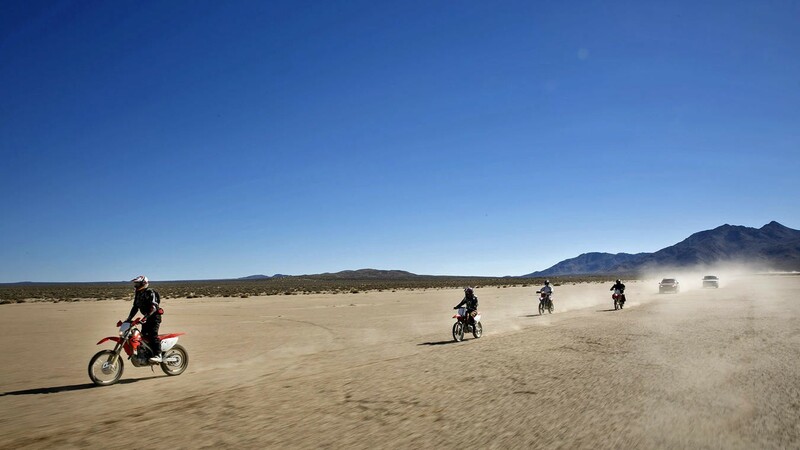 Bill Tuchscher had been riding dirt bikes in the desert for more than two decades when he and a group of friends set out for a weekend ride near Anza-Borrego Desert State Park. Late in the afternoon, far from their camp, the riders became tired. It was well over 100 degrees, and their water bottles were drained dry. Tuchscher, seeming disoriented, fell. Then he fell again. He pushed his bike into a bit of shade, took the group’s only map out of his pocket and gave it to one of the other riders. He told them to head back to the camp while he rested up. He never followed. Hours later, a search party came upon his body — not far from a running stream filled with fresh water. That was May 1977. Tuchscher, who ran a motorcycle shop in San Diego, was buried at Glen Abbey Memorial Park in the nearby community of Bonita. Hundreds attended the service. The procession from church to cemetery was escorted by 100 motorcycle cops. The Tuchscher family rides out on motorcycles to memorialize their father, William Cory Tuchscher, at the Husky Monument near Randsburg, Calif.
Late last year, his family traveled to a remote location in the Mojave Desert to add Tuchscher’s name to a little-known shrine dedicated to fallen motorcyclists — to honor him, and his love of motorcycles. The shrine is known as the Husky Memorial or Husky Monument. It cradles testamentary stones and statues honoring dozens of riders — men and women. Circular and 60 feet across at its widest point, with a tattered American flag snapping in the wind, it’s sacred to Southern California motorcyclists, especially those who ride in the desert. It’s not marked on any map, and it’s 15 miles from the nearest paved road and 30 from the nearest town, but serious riders always find a way to make a pilgrimage there. The original monument dates from 1987, when the Desert Zebras Motorcycle Club decided to memorialize a friend, Jim Erickson. The 46-year-old veteran desert racer had killed himself. His friends, grief-stricken, chose to honor him by taking his motorcycle to the desert and burying it up to the hubs in concrete. The bike was a race model made by the Swedish company Husqvarna, familiarly known as a “Husky.” Every weekend for several years Erickson’s friends would ride out to the monument and pay their respects. 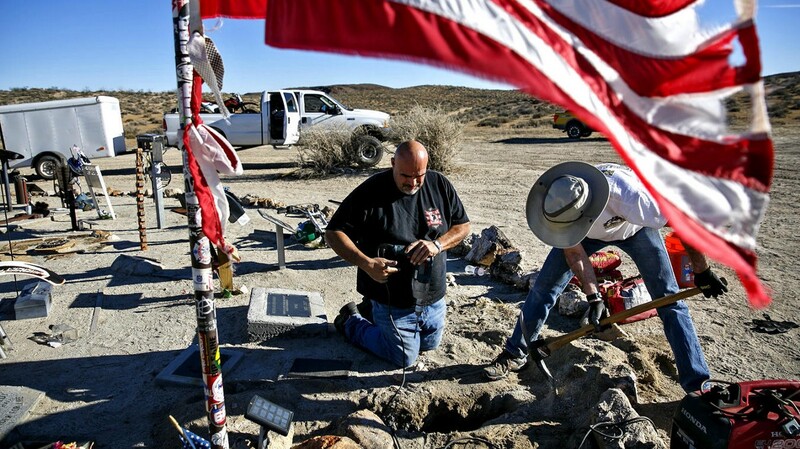 Over time, additional memorials began appearing — a pair of boots fixed in concrete, a helmet and goggles set on a post, a headstone or a plaque planted in the sand. Within 10 years, there were at least a dozen other riders memorialized there. 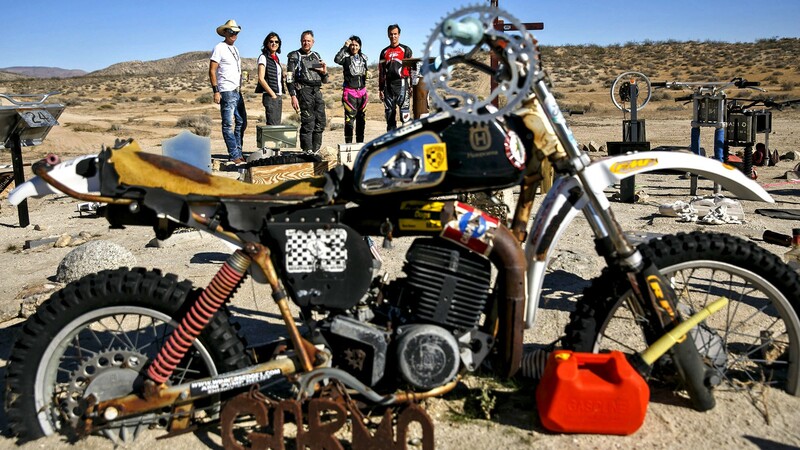 In a secret location in the Mojave Desert is the Husky Memorial — a monument to fallen dirt bike riders. 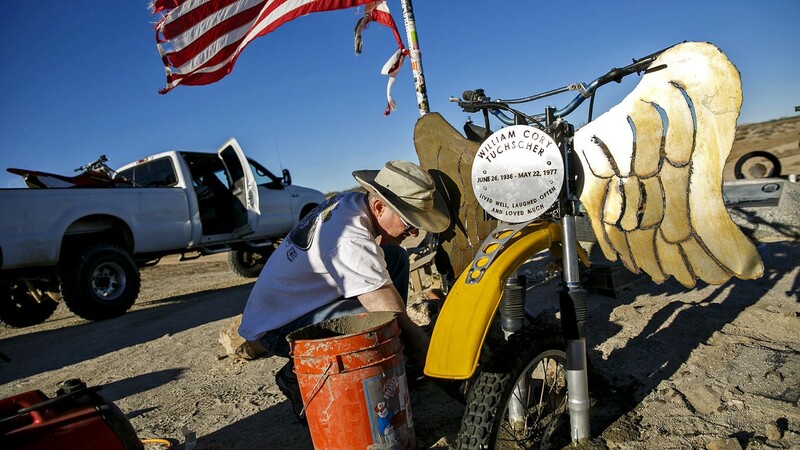 It was created nearly 30-years-ago by a group of friends who had planted a buddy’s Husqvarna dirt bike in the middle of a desert trail that they had all ridden on. Douglas Anthony Clark — “Son, brother, friend” — was commemorated in 1999 at age 18. Little Jimmy “Bitchin’” Lewis, a fellow Desert Zebra, got his plaque in 2002. Other Zebras were nearby, like father and son Bob Lamar (died 1999) and Jim Lamar (died 1996). In 2005, Ron “Ogre” Griewe, a Zebra who rode with Erickson and whose son Donnie welded Erickson’s original Husky memorial, joined them. The first few honorees were all friends. Those who came later might never have known the owner of the original Husky. But they all shared his love of riding in remote places. Stephen Marks, left, Fernando Garcia, center, and Jon Kessler get ready before they head out to the Husky Monument to memorialize the late William Cory Tuchscher near Randsburg, Calif.
On a cool, blustery winter morning last November, Stephen Marks and Fernando Garcia chopped at the dry desert soil with shovels and picks. Television literary manager Marks, who married Tuchscher’s daughter, Michelle, many years after her father’s death, was helping motorcycle shop owner Garcia pick a spot for the memorial they’d made — metal angel wings welded to the front end of a vintage bike. Garcia used a plastic tub to mix cement, which Marks shoveled into the ground. Husky Memorial sits in the middle of a massive swath of land controlled by the federal Bureau of Land Management. For years, rumors have swirled that the BLM wanted to tear down the monument, fearful that leaving it alone would create a legal precedent for unsanctioned building in the desert. Stephen Razo, external affairs officer for the BLM’s California Desert District, said the agency has no plans to disturb it, so long as it involves no danger to people or the environment. Across the circle from Marks and Garcia, a family had come to honor Trevor Neiman, who had grown up in nearby Phelan and spent his childhood riding in the desert. After three tours of duty with the Marines, he returned to California and worked with his father as a cable technician, got married and bought a home. In 2009, six months after leaving the Marines, he was attacked and beaten to death with a hammer while installing cable at a private home. He was 25. A friend put up a marker for him at the Husky site. When his family found out about it, they began making twice-a-year pilgrimages, planting Neiman’s motorcycle forks in a bed of cement, and adding a red tool box full of family photos. Neiman’s father Neal, mother Lorale and sister Casie placed six coins on the tool box, to mark the years since his death, and put new photos in the box. Marks and Garcia, tidying up, tied a tarp over their monument. The following morning they would return, with Tuchscher’s widow and three children, for the official unveiling. Sunday morning, the convoy drove in from Randsburg, a former mining community 27 miles away, the closest town to the Husky memorial. 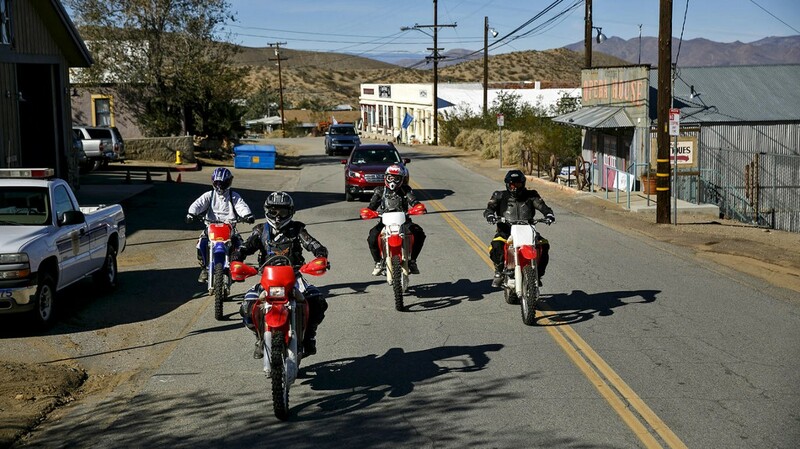 Marks, Garcia and several friends led the way on off-road motorcycles specially designed for desert riding. Behind, in four-wheel-drive Jeeps and trucks, came the large and extended Tuchscher family. His widow Olga Krasnoff, 76, rode with her son Billy, 53, and his two adult daughters. Tuchscher’s daughter Rene chased Marks and Garcia on a dirt bike. Her sister Michelle rode behind with friends from San Diego. It took an hour and a half to reach the memorial. The family gathered in a wide semi-circle around the monument, several of them stunned at the number of other riders honored there. Marks remembered learning about Tuchscher, the father-in-law he never met. The angel-winged motorcycle bore a metal number plate, inscribed with part of a poem often attributed to the Scottish writer Robert Louis Stevenson but actually written by American essayist Bessie Anderson Stanley. In pairs, or alone, Tuchscher’s family members stood in front of the monument and had their pictures taken. Olga hugged Garcia, and thanked him again for his elegant work, and for spelling her husband’s last name correctly. A few stray bikers, who had ridden in on their own Husky pilgrimage, asked about the fallen man, and told stories about riding friends who’d passed away. Billy gave them beers, and together they toasted Tuchscher’s angel wings. Originally published at www.latimes.com on July 29, 2016.